I was laid off this past Friday. That marked four years and three weeks since I had started at that particular job, if anyone is counting. After three years, I had finally earned a bump in vacation time. At my previous job, even though I worked the same position for for years, the ownership of our division changed hands, so it never counted toward the bump in vacation. I feel like I’m playing Chutes and Ladders. Luckily, I already had plans that same night to have dinner with a friend and her family. The mom works for HR in a government agency and she offered to help me with their job website and offer tips for searching. I’m hoping to get hired on with the government because there is more stability, great benefits, and opportunities for training and advancement. Also, there are some options to eventually transfer to another part of the country, without having to give up the pension and other benefits. I’m going to be applying to places in Richmond, Fredericksburg, and the DC area. They won’t all be government of course, but I think that’s where my heart is set at the moment. After working for small businesses for 10 years, I would definitely like to see what it’s like to work for a larger company. Who knows where I’ll end up though! I posted on Facebook and Twitter and called a few people. The response has been really great. I’ve gotten a ton of people who offered to pass along my resume (as soon as I polish it up!) and a bunch of links to job openings. Thanks friends! One friend-couple even offered me financial help! I was so blown away, I was choking up. I feel so alone at times (like everyone) and it was wonderful to know that there are people who care that much. I tripled my course load for the upcoming eight week semester. I’ll be doing three classes, instead of just one. If my request is approved, I will be taking two classes the following eight weeks. Unsubscribe from all store emails and most shopping-related blogs. Go to unemployment office. Figure that whole thing out. Determine how much I can make, before it affects unemployment benefits. Find part time job that will fill that gap. Fix up resume. Some people have already reviewed it, but I have two others who offered to help as well. I need to get that to them early this week. Plug my resume into USA Jobs. There’s a job that I’d really like and I only have another 10 days before it closes. Clean up my home office area and unload all my boxes from work. Beg someone to code me a simple website. Get files off my work computer. Get PDF samples of projects I’ve done. Put as much stuff up for sale on Craigslist or eBay as possible. Talk to realtor about doing a short sale on my house. Attend a bunch of networking events and career fairs. Speak to patient advocate about volunteering. Set up a schedule so I don’t slack on job hunting, but also don’t get overwhelmed. I know that sounds like a lot and is probably boring for you all to read. I’m sure I’ll have more details about different aspects as this progresses. I’m really bummed out now, and having a hard time not taking it personally. But I really do think that there will be a few silver linings out of this situation and I’m lucky that my parents and some friends live close enough to help me (and some others can help virtually)! Everyone send good vibes and job openings! I recently placed my first order with UK clothing website, Wallis. 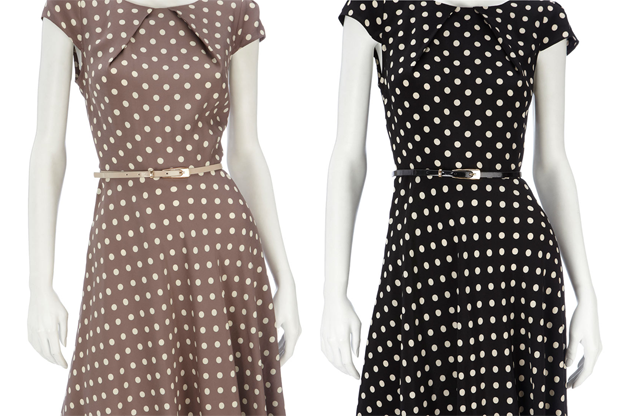 I ordered the Taupe Spot Print Belted Dress, shown in the pictures. I also picked up a black jersey dress for only $18, but that one was too small, because I ordered it in petite and didn’t account for the stupid fact that petite sizes are normally smaller in all measurements, not just shorter. I ordered both dresses in size 4 (which is a size 8 in UK size, but they display American sizes on their .com site). Obviously I would order a size up in petites next time. I am very happy with the way both dresses looked. The quality is not fantastic, but for the price, I think it is a reasonable quality. 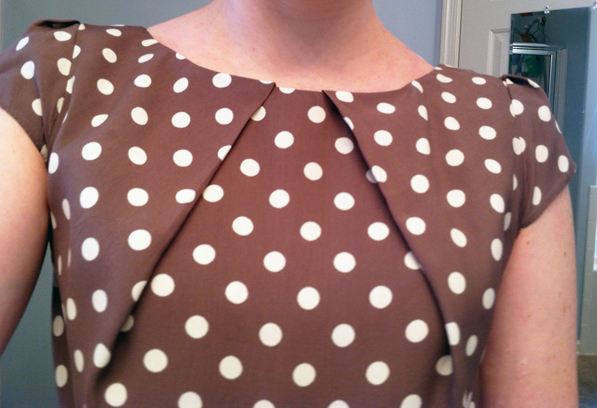 The dress is not lined, and the zipper is a little difficult. The belt it comes with is pretty low quality, but that is to be expected even with a higher-priced dress. Both dresses were machine washable, which is a huge thing for me. Wallis offers free shipping with orders over $30. You do have to pay for the return shipping, though. The sell clothing, petites, shoes, accessories and even beachwear. Probably only 30 percent of the items for sale appeal to me. Some of their items look a little too trashy or crazy for me personally. The items arrived on individual hangers (marked with the UK sizes), sealed in protective plastic bags. The price for this dress has changes at least 3 times since I bought it, so definitely keep an eye out for sales. I think it was about $50 when I bought it and it is currently $63. I would recommend checking them out!